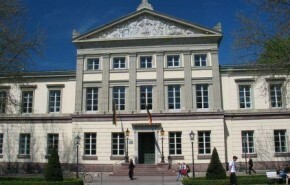 Founded in 1737, the Georg-August University of Goettingen is a research university of international renown with strong focuses in research-led teaching. The University is distinguished by its wide range of programmes [particularly in the humanities] and its excellent facilities for the pursuit of scientific research. In 2007, the Georg-August-Universitat achieved success in the Initiative of Excellence of the German Federal and State Governments with its institutional strategy for the future entitled “Goettingen.Tradition; Innovation; Autonomy”. This distinguishes Goettingen as one of the nine German universities officially rated as holding the potential for global visibility and, according to the university, “a place amongst the foremost institutions of higher education in the country”. Approximately 24,000 students currently study at the University, some twelve per cent of whom are from abroad. Goettingen, situated in the middle of Germany between the Harz mountains and the Weser river, is well-known for its University. The historic city centre, enclosed by the remains of the mediaeval town wall, is home to magnificent churches and half-timbered houses dating from the 14th to the 18th century. Much of the urban life takes place within the old town walls. All places of interest are at most a leisurely ten minute walk.Goettingen’s landmark is the Ganseliesel figure on the fountain at the market square in front of the Old Town Hall. This art nouveau statue figures a girl herding geese. It is a tradition that all new doctoral graduates from the University kiss the cheeks of the statue after passing their examination. This makes her ” the most kissed girl in the world”.